Polbase - Reference: Structural basis for proofreading during replication of the Escherichia coli chromosome. Structural basis for proofreading during replication of the Escherichia coli chromosome. The epsilon subunit of the Escherichia coli replicative DNA polymerase III is the proofreading 3'-5' exonuclease. 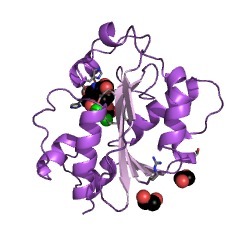 Structures of its catalytic N-terminal domain (epsilon186) were determined at two pH values (5.8 and 8.5) at resolutions of 1.7-1.8 A, in complex with two Mn(II) ions and a nucleotide product of its reaction, thymidine 5'-monophosphate. 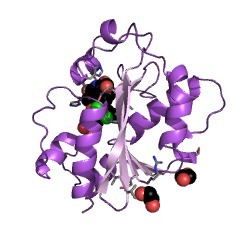 The protein structure is built around a core five-stranded beta sheet that is a common feature of members of the DnaQ superfamily. The structures were identical, except for differences in the way TMP and water molecules are coordinated to the binuclear metal center in the active site. These data are used to develop a mechanism for epsilon and to produce a plausible model of the complex of epsilon186 with DNA.